For anyone who needs major dental work & has no insurance for it or cannot afford it: I just got a crown for a broken tooth in Progreso, Mexico (just across the US border from Texas) at a respected dentist–for $300. It costs $2,000 on this side of the border & more in other parts of the US. Before Syriza won the Greek elections last January, it campaigned for a more humane immigration policy. Under the previous regime, Greece functioned as the first gatekeeper of EU/Frontex immigration policy & its practices were barbaric. It erected a militarized wall on the Turkish border; housed immigrants & refugees in squalid, overcrowded detention centers; fostered right-wing vigilante & police violence in refugee neighborhoods; made it near-impossible to get transit papers to move beyond Greece forcing thousands to live homeless. Since Syriza’s win, Greece has been allowing hundreds of thousands of refugees to enter & transit through its territory. There have been problems–like reports Greek (& Turkish) coast guard ships were disabling refugee dinghies & abusing refugees at processing centers. But they were not being rounded up, jailed, assaulted, or so massively obstructed from traveling, as previously. With Syriza now showing its Janus-faced politics, it was only a matter of time before they began cracking down on refugees & again playing their role as first gatekeeper for the EU/Frontex. What they’re trying to put an end to are the protests by refugees denied transit–hunger strikes, sit down protests, chanting, train blocking. Macedonian police have not only been shooting rubber bullets at unarmed refugees, but in freezing weather with snow on the ground, they have been spraying them with water hoses. During the operation, “humanitarian workers” like Amnesty International & UN refugee officials along with reporters & photographers (some of whom were briefly arrested) were kept two miles (three kilometres) from the area. Because there is no question unarmed refugees were going to be roughed up as they resisted relocation. Media reported tonight that the UN refugee official on the site said there was nothing they could do except offer sympathy. How about screaming bloody murder & making an international incident about the human rights crimes being committed by the EU/Frontex, Macedonia, & Greece? This young man is one of the refugees forcibly removed for deportation. 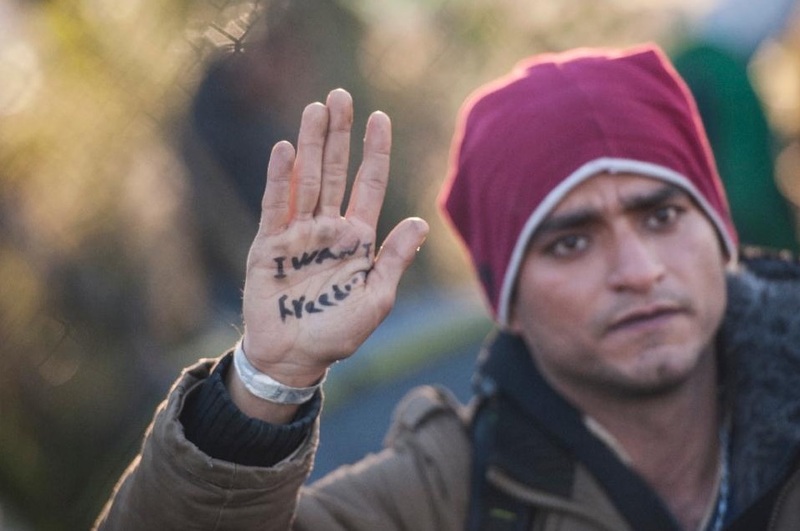 The writing on his hand says “I want freedom.” We want freedom for him. And for that, international solidarity is of the essence. Immigration is a human right. Open up the damn borders. No deportations. It may be time to weep for the republic. It sure as hell is time to organize against this crap before it goes any further.